An indirect, albeit dire warning has been issued to tourists! The warning doesn’t come from Thai Tourism, but from reported and unreported fatalities, from the cry of hapless victims that didn’t see it coming, and from many foreign governments and embassies urging the Thai government to act. Every single bloody day, Tourists(and Thais) die in a number of tragic and unnatural ways in Thailand- with road accidents being the prime killer. After writing “A Place To Be Killed: Tourist Alert Thailand” in2014 (505 pages), the tourist carnage was as bad or worse for the November 2014 – April 2015 period. I love Thailand, its people, but things need to change in terms of safety. I sure hope proactive change starts in my life-time. 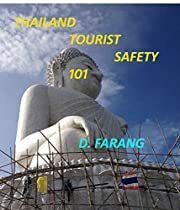 I want tourists to be forewarned again about the myriad of dangers in Thailand, and therefore forearmed in terms of their own personal safety when in the beautiful country. Inundated with foreigner fatality reports again this high season, proactive safety measures must be undertaken by Thai authorities to decrease the daily carnage. Sustaining the work and not backsliding will be key, because in Thailand, occasionalcrack-downsfrequently lose their momentum quickly. Thai authorities need to clearly realize that profit margins and tourist safety go hand-in-hand. Like quality tourism, profit and safety are intrinsically linked together. Touristshave a big say in the matter – changing many bullet-proof attitudes will be a challenge for individuals in the present age of western entitlement. The question remains unanswered – what catalyst(s) will finally move Thailand forward towards systemic changes in how safety is viewed for its own citizens, and for over thirty million tourists that visit the Kingdom annually? But enough isn’t enough it seems, whether we are talking about excessive tourist deaths in Thailand by un natural causes, or the lack of information out there for tourists. Foreign governments aren’t doing much in terms of warnings, and either is T.A.T. (Thailand Tourism Authority), judging from the renewed tourist carnage in 2015, with all the usual foreigner fatality factors. But why point fingers? That never saved a life; the complaint box is full to bursting, so lets find a solution, strictly in the interest of saving someone’s son or daughter from the body bag industry. Guess what learned ones? The well-used slogan “Amazing Thailand” doesn’t cut it for victim families, left to suffer in silence, grieve and wonder how it all went so wrong for their loved ones in Thailand. The bottom line is, most tourist deaths in Thailand are avoidable, hence another offering on the subject is prudent at this time. Being proactive will save your life.